For anyone looking for an online resource to buy or invest in Bangkok property, it is natural to want to know the credentials of the Editorial! We commend you for your skepticism, as questioning information will be the key to making educated and successful financial decisions in Bangkok’s wild real estate market. To keep it simple, the content of this guide was directly written by Fresh Property’s management team, in close collaboration with its sales agents. This means that the editors have direct experience in both assisting buyers and investors. While we do not claim to be “know-it-alls” and we do admit that “Ultimate Guide” is a presumptuous title, we feel that advising buyers with multi-million-baht purchases needs to be done by professionals. We are enormously proud to have advised hundreds of buyers since early-2015, assisting them in the negotiation, conveyancing and transfer of both resale and off-plan condos. However, it is important to note that at the time of this guide’s publication, several members of the Editorial are directly invested in the Bangkok property market and understand the ups-and-downs of ownership! So how to use this guide? Worry not potential buyer, each section is stand-alone and therefore can be read in isolation. We encourage readers to simply skip to the relevant section, as and when it is required. Technically, whole books could be written about buying and investing in Bangkok. However, we have tried to keep the guide simple and straightforward. For those looking for extra insight, we have peppered our content with links to further information. 1.1 Why Buy in Bangkok? 1.2 Can Foreigners Own Property in Thailand? 1.3 Buying Off-Plan or Resales Condos? 2.1 Factors to Consider when Buying? 5. Conclusion of this Buyers’ Guide! This section will provide basic information about local real estate standards. Buyers will gain insight into the dynamics of the market and the Editorial will offer practical advice on how to approach a property search. Bangkok is an amazing city, as it manages to offer both an exciting lifestyle characteristic of a world-class global destination and the dynamic professional prospects, of an aggressively growing South East Asian Capital. Therefore, the reasons to buy in the Thai Capital are numerous; with a combination of both Thais and Foreign Nationals investing into home ownership, rental investments or simply speculating on the market. 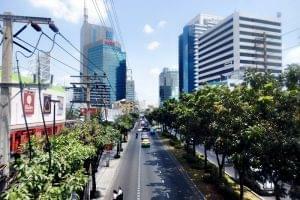 Bangkok’s real estate market has been a hot industry for the Thai economy for several years. The market has been booming, resulting in the gradual price hike of developable land plots especially in Central Bangkok. This has inevitably had a knock-on effect on resale and off-plan market, that has experienced and upward trend in price per square meters. 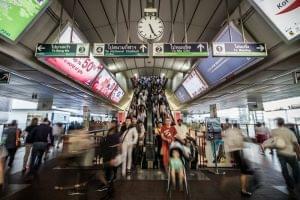 It is estimated that Bangkok welcomed 20.5 million visitors in 2017, ranking the City as one of the top-5 global destinations according to the Mastercard Global Destination Cities Index. This popularity doesn’t come as a surprise, as the City offers an incredibly diverse and exciting lifestyle. Offering wide-ranging experiences to suit everyone, from shopping malls, dynamic night life, amazing food, and beautiful culture. 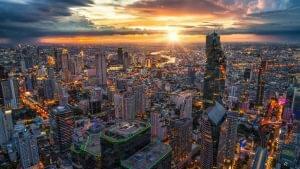 On a career and business level, Bangkok is a “primate city” and is Thailand’s biggest and most dominant urban center. With most of the country’s local and international businesses, having headquarters in the metropolis. The social and professional factors above, are complemented by the fact that Bangkok is geographically located in the center of the vibrant South East Asian region. Making it easy for travelers to connect or visit neighboring Asian destinations. Bangkok has an active rental demand, due to its importance as a financial and business center for both Thailand and South East Asia. In many cases, renters are working professionals, which is appealing to landlord’s due to their stability. While yields and rental returns can vary depending on location and condo project, they tend to range between 4-6% especially in Central Bangkok. This is attractive, especially compared to other more expensive global cities. 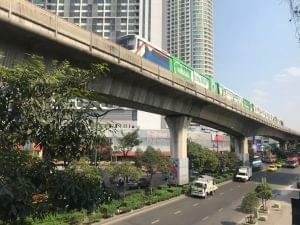 On top of this, Bangkok is still developing, and it is currently experiencing a boom in mass transit (BTS/MRT) extensions. This has the potential to massively redefine the city, connecting peripheral neighborhoods and shifting business centers across the metropolis. While infrastructure is shifting and redefining localities, Bangkok is also experiencing mass gentrification. From area transforming commercial developments to more modest redevelopment of neighborhoods. This urban transformation has resulted in an upward trend in condo prices both resale and off-plan. It is difficult to predict future capital appreciation returns, as there are numerous variables within the vast city. 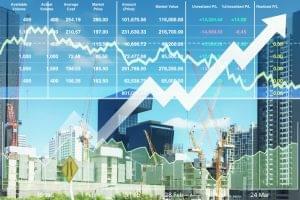 However, Bangkok’s attractive economic fundamentals, mean that the upward trend is likely to continue in the years ahead. This subject will be reviewed in greater detail in the Property Taxes Section below. However, an important factor for investors is the fact that Property Taxes in Thailand are attractively low. As a rule of thumb, property sellers will only need to pay between 5-8% of the sales prices in taxes. On top of this, Income Tax is relatively low for investors with modest property portfolios. For more reasons why Bangkok is an attractive investment destination, visit “5 Reasons to Buy in Bangkok”. There is often a perception that Thailand’s property laws are complicated; however foreign property ownership, follows a very simple and comprehensive legal framework. This makes ownership of landed property, such as villas, townhouses or shophouses problematic. Legally-speaking foreigners can only lease land for a period of 30-years. Despite this, foreign buyers often try to bypass this restriction by using strategies that allow them to effectively “control” ownership of land. This includes legal loopholes such as setting-up Thai companies, to purchase plots of land. Complications and issues can arise from these “legal set-ups”, that sit in a grey-area of the Thai legal system. As a result, Foreigners looking for direct ownership and relatively liquid asset in Thailand are advised to solely consider Condominium Freehold ownership titles. Foreigners can only buy up to 49% of a Condo Project’s total registrable area (Foreign Quota) with the remaining 51% being owned by Thai nationals (Thai Quota). If an international buyer wishes to purchase a unit in a project where foreign quota is sold-out, they may do so only on a leasehold basis. For a more in-depth look at the details of Foreign Property Ownership, please visit “Can Foreigners Own Property in Thailand?”. Buying Off-Plan or Resales Condos? 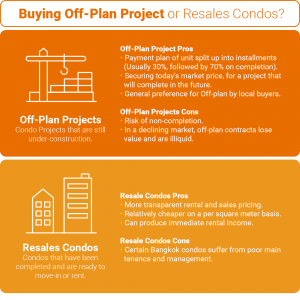 All buyers starting their condo search in Bangkok will inevitably need to consider whether to buy off-plan (Under-construction) or resale (Completed). Both types of investment offer pros and cons, that suit investors with different risk profiles. 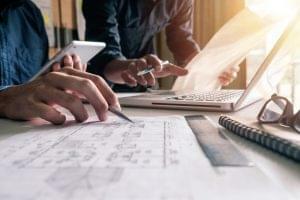 Since Off-Plan Projects are not yet completed, developers split up the payment plan into 2-installments for foreign buyers. Usually requesting only 20-30% of the total price upfront and the remaining amount just before transfer. This offers buyers a low entry price and can be a great way to speculate on the market, with lower up-front investment. In effect, off-plan projects allow buyers to secure today’s market price for a project that will be completed in 2-3+ years. This can be a great way to profit, especially in a rising market. The local Thai market and Asian buyers in general, tend to prefer off-plan projects. The biggest investment risk is non-completion of the condo project. It is always important to do careful due diligence into the developer and promoter of these investments. It is important for buyers to be cautious when buying Thai off-plan projects overseas. As international promoters and developers may sometime offer double or tiered pricing; with higher prices offered to foreign buyers or via overseas sales channels. While unethical, this is a common practice to make-up for the cost of advertising overseas. In a slowing or declining property market, investors may be unable to flip their off-plan contract. Resale condos offer a historical record of rental, sales and completed transaction prices. Thus, making evaluation of potential returns more predictable. Condos on the secondary market are usually relatively cheaper on a per square meter basis, compared to their off-plan counterparts in the same location. This is due to a combination of age (I.e. Aging facilities, etc.) and the local market’s preference for newly launched projects. Resale condos can produce rental income immediately; in many cases, second-hand condos are even sold with a tenant. Certain resale condos in Bangkok are suffering from substandard building quality or poor ongoing property management. Making these condo buildings potential investment traps. Thais are predominantly the biggest buyers of Bangkok Property and they tend to prefer off-plan or newly launched condos. Bangkok is a huge city, with hundreds of neighborhoods and thousands of potential condo projects to choose. Buyers that fail to do due diligence and careful market research, may end up “running in circles” or worst, being misled by deceitful property sellers. Therefore, the Editorial always encourages buyers to conduct market research. Finding the best deals and most lucrative opportunities in the Capital, requires self-reliance and understanding of the local market environment. The Central Bangkok rental market is primarily expat-led, as foreign residents of the city tend to value convenience and proximity to the capital’s business centers. The most popular neighborhoods for expats are located within the Central Business District. These are Sukhumvit (BTS Nana- On Nut), Silom-Sathorn, Ploenchit-Wireless, and Rama 9- Ratchada. Thais have a property ownership culture and therefore working professionals progressing in their careers, tend to prefer buying their own homes rather than renting. As a result, Thai renters often tend to be younger working professionals, preparing to step on the property ladder. When conducting research, buyers should be careful to distinguish between marketing materials dubbed “advertorials” and reliable trusted information. The local property market is led by hype and mis-selling is unfortunately common practice. The leading Investment Consultancy in the Capital is CBRE and they often publish special reports and a variety of quarterly and yearly market stats. Other consultancies such as Knight Frank and Colliers, also offer residential property market reports and research. Leading English Newspapers such as The Bangkok Post and The Nation have active property editorials reporting on news and trends. Interestingly, The Bangkok Post also runs a special property issue twice a year, reporting on the status of the Thai residential and commercial markets. In terms of magazines and online publications, The Property Report recently acquired by Guru Property a Singaporean Property Portal Group offers insightful editorials about Thailand from time-to-time. An active way to conduct research is by attending Property Shows and Exhibitions, these are a popular outlet for local developers to sell their stock. The most reputed show is The House and Condo Show usually hosted at Queen Sirikit. Several discounts and flash deals will be offered during those events, and it is important to keep a cool head and a calm mind. This section will focus on providing specific and practical tips for property selection. Offering advice and insights into the local market conditions and investment climate. The Editorial believes that the key to making successful property investments, is by developing a deep understanding of the local market! Factors to Consider when Buying? Buying in Bangkok is in large part, like investing in any international city; “location, location, location” is undoubtedly the primary factor in any purchasing decision. However, there are several locality-specific considerations, that also need to be considered. Buyers are advised to understand local Thai context and Bangkok standards, as this is the key to successful investment decisions. Frequent gridlocks especially during rush hour, the tropical heat, and the contrasting downpours during rainy season, mean that most of Bangkok’s residents prefer travelling via Mass Transit (BTS Skytrain or MRT Underground). Buyers looking for a viable rental investment, are therefore advised to buy in proximity to a BTS/MRT Station. Before buying, it is also important to understand the resident-profile of the neighborhood; as different areas appeal to people from different economic and social backgrounds. Therefore, it important to understand that the demand for rental or sales property is not constant throughout the city. As general rule of thumb, it is always important to compare price per square meters (PSM) of a condo building in relations to the neighborhood PSM and to the units PSM in the project. By doing so, it is possible to evaluate the relative value and attractiveness of a specific property. On a second note, there is no escaping the fact that Bangkok has a large supply of condos. Therefore, savvy buyers should always aim to find properties with a competitive edge, acquiring an asset that stands out. Buying a condo dramatically under-market price. Buying a property with non-standard and/or a spacious layout. Projects that are in immediate proximity to BTS/MRT and/or that offers unique set of amenities to its residents. 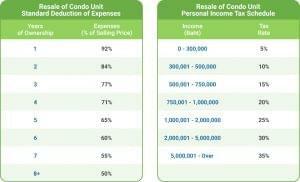 Therefore, buying in a project or owning a condo unit that offers comparative advantage, is crucially important. Owning a property is a status symbol. This is extremely apparent in Bangkok, where Developers carefully brand and conceptualize lifestyle themes around their projects. As a result, the local market is “brand” sensitive, with certain developments benefitting from positive associations and premium prices. Therefore, as a buyer, it is always a good idea to consider Projects that have been developed by reputable and popular developers. Some notable developers with such associations include Sansiri, Raimon Land and Ananda. Another reason for buying into projects by established developers, is because they often have strong after-sales management plans. Building Managements oversee a condominium’s maintenance and have significant impact on the project’s future value. A well-managed condominium will inevitably rise in price, however on the flip-side, it is not uncommon in Bangkok for projects that have been mis-managed, to turn into value traps for investors. Age, developer and amenities of a project. Size, floor and layout of a unit. All these different considerations can make providing an exact price range for different neighborhoods a difficult task. It is important for buyers to understand that these are broad generalizations. There are always exceptions to the rules above! Any buyer starting their property search, will quickly need to establish where the commercial, business and leisure centers are located in Bangkok. Therefore, local property professionals have coined a name for these geographical hotspots, referring to them as the Central Business District (CBD). In recent years, residential and commercial development activity has concentrated in Bangkok’s CBD. On top of this, the areas making-up the prime-districts are usually well-connected by a network of Mass Transit Lines notably BTS Skytrain, MRT Underground and ARL Light Rail. As a result, these prime-areas have developed a convenient, appealing and desirable lifestyle; combined with a vibrant business and commercial ecosystem. The evolution of the urban and social landscape of Bangkok, has transformed the CBD into both a popular rental and investment zone. With homebuyers, buy-to-let investors and renters clustering in this section of the City. So what neighborhood make up the Central Business District? Sukhumvit’s appeal lies in its lifestyle diversity; with business centers such as Asoke appealing to active working professional and leisure hubs such as Phrom Phong and Thonglor offering a more peaceful residential community vibe. Residents of Sukhumvit, have access to a variety of shopping malls, restaurants and cafes. On top of this, the district offers an active social scene and eclectic nightlife. This is complemented by the fact that Sukhumvit, has a range of residential options to meet a wide variety of investment budgets. 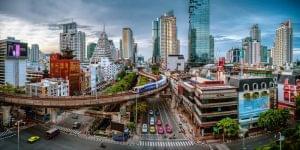 Often compared to London’s City or New York’s Manhattan, Silom-Sathorn is Bangkok’s financial hub. Its edgy high-finance environment has transformed the area into a classy-modern business and residential hotspot. The area offers a range of A-Grade Office Towers and a great collection of residential options such as the iconic residences at the MahaNakhon. It’s affluent residents, have nurtured a unique community of independent restaurants, coffee shops and bars. Offering a convenient, trendy and cool lifestyle option. This ultra-prime section of Bangkok is where the most expensive addresses of the Capital are found. 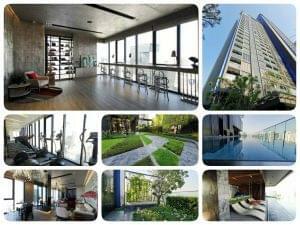 The most expensive Bangkok residence to date “98 Wireless by Sansiri”, is located on Wireless Road. 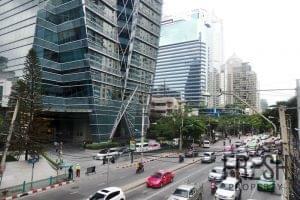 BTS Ploenchit and its illustrious Wireless Road, is host to numerous Embassies (I.e. Embassy of the United States, Japan, and Switzerland), A-grade office towers and luxury residences. On top of this, the heart of Bangkok’s retail and leisure scene, the Ratchaprasong Intersection (BTS Siam) is located next door. Therefore residents, benefit from a comfortable, convenient and pleasant lifestyle. 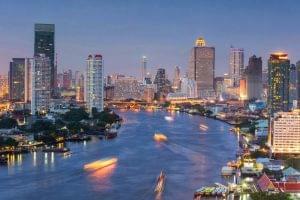 Often referred to as the “New Bangkok CBD”, it is the newest addition to Bangkok’s prime-areas. It is a vibrant and fresh business neighborhood, that hosts a cluster of office towers notably the G Tower and AIA Capital Centre Building. The presence of the Stock Exchange of Thailand gives the area a unique business cachet. On top of this, the area offers a dynamic retail scene with shopping centers such as Esplanade, Fortune Town, and Central Rama 9. The area also has a dynamic night life, with the iconic Ratchada Night Market and a range of bars and nightclubs. Obviously, any location or neighborhood located outside the boundaries of the Central Business District are dubbed “Peripheral Areas”. Interestingly, the mass-development of Central Bangkok combined with relentless upward trend of property prices, has led to a spillover effect. Buyers and renters priced-out of the CBD, often look at areas further down the prime-BTS/MRT Lines. In recent years, several peripheral areas have gradually transformed into appealing and desirable neighborhoods. Offering a unique opportunity for investors and home buyers to invest in up-and-coming locations, that offer relatively more affordable property options and attractive upside potential. Phra Khanong and On Nut have emerged as Sukhumvit’s go-to affordable residential hubs. Located only 2 to 3 BTS Stations away from desirable Thonglor, the neighborhoods offer convenient BTS access to Central Bangkok and is popular with working professionals and young families. Both areas a gradually gentrifying and now offer residents a pleasant lifestyle with a range of shopping malls, convenience stores, restaurants and cafes. This makes both areas ideal hotspots for investors looking for a stable rental investment, with the addition of potential capital appreciation gains. A residential suburb popular with Thais, it is popular with families and working professionals looking for a community and family-friendly environment. Commuters living in the area, can easily travel to Rama 9-Ratchada, Asoke and even Phaya Thai- Ratchathewi business and commercial districts. The rising popularity of Phahon Yothin-Ladprao is fueled by numerous factors. This includes the extension of the BTS Green Line, relative affordability of the area and the pleasant lifestyle it offers. The Chayo Phraya River offers some of the most scenic and beautiful views of the Capital. This natural beauty and the retro-class of the riverside has inspired ultra-luxury developers to launch a series of stunning private residences in the area. This includes a handful of branded residences, notably Banyan Tree Residences Riverside Bangkok, Four Seasons Private Residences Bangkok and The Residences at Mandarin Oriental Bangkok. The area has also welcomed the launched of IconSiam a glamorous and luxury riverside mall. Redefining Thonburi-Riverside’s appeal, as a five-star residential address. 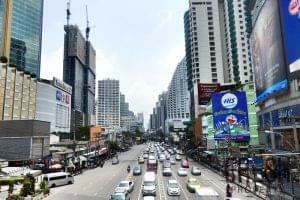 The perception of Rama 4 being a gritty thoroughfare, is quickly shifting with many property professionals predicting that it will become the next “Sukhumvit Road” in terms of appeal. 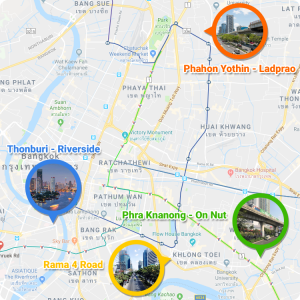 Rama 4 road is a major artery connecting different parts of the CBD notably Sukhumvit, Ploenchit-Lumphini and Silom-Sathorn. This strategic geographic location has propelled the area into the spotlight, with several commercial developers launching ambitious mixed-use projects. This includes area redefining developments such as One Bangkok, Samyan Mitrtown and The PARQ. This hive of commercial activity has also encouraged residential developers to make forays on Rama 4. With new projects by established developers being launched such as Ideo Mobi Rama 4 and Oka Haus by Sansiri. In Bangkok, there is an undeniable divide between old and new projects. With both types of condos offering a unique set of pros and cons to buyers. Old condos are any projects over 5-years. This section, will obviously deal with several generalizations and readers should understand that the factors presented, will not always apply to every condo! The local Thai market has a general preference for new projects, usually making them vastly more popular than their “older” counterparts. This popularity tends to translate into premium prices and more liquidity. New projects often offer impressive building facilities and well-presented common areas. Recently launched condos tend to be developed with modern building standards and high-quality designs. The increasing price of developable land especially in Bangkok’s Central Business District, means New Projects are usually offered at a more expensive price per square meter compared to old condos. The trend is for new condos to offer units with compact layouts; such as 1-Beds ranging between 28-35 Sqm and 2-beds ranging between 45-65 Sqm. This can result in lower rental yields, especially compared to the market average of 5%. Old condos offer an opportunity to invest in prime-areas or well-located locations, at a relatively cheaper price per square meter. The Thai market’s preference for “New Condos”, means older projects have not increased in price as fast as new launches. Certain old projects offer units with non-standard and spacious layouts; such as 1-Bed ranging from 50-75 Sqm and 2-Beds offered at over 100 Sqm. Offering greater space and more comfort to people living in these properties. Some old condos are “value traps” that are either poorly constructed (Requiring constant maintenance) or badly managed (Common areas look shabby and facilities under-maintained). These types of condos unfortunately do not benefit from much capital appreciation and tend to be difficult to rent. Depending on the project’s popularity and the general condition, some old condos struggle with liquidity/resale issues. This section will introduce buyers to the process of buying a resale or off-plan property. Reviewing the stages of a property acquisition, from the initial negotiation, to the eventual transfer of ownership at the Land Department. Buyers often have questions about property financing and taxes incurred on resale. Therefore, the Editorial will end this section with a discussion and some practical advice regarding these matters. This section will offer a simplified and step-by-step overview of the buying process from “offer to transfer”. 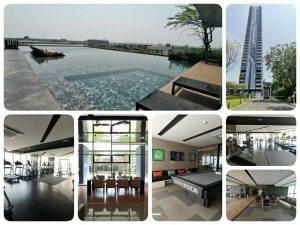 The process of buying a resale condo in Bangkok, is surprisingly straightforward. 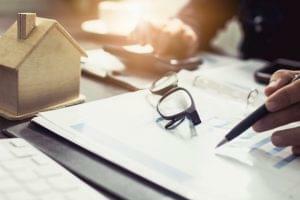 Its relative informality and the light amount of legal paperwork involved, especially compared to purchasing a property in Europe or the US can often baffle foreign buyers. However, this perceived simplicity, means an extra level of caution and self-reliance is required. In any market, knowledge is power and good preparation is the key to making informed purchase decisions. *It is usually standard, for the seller to pay for all the sales taxes (Notably Income Withholding Tax, Special Business Tax and/or Stamp Duty) and for Transfer Fees to be shared equally (Buyer 50%/ Seller 50%). However, this is usually at the discretion of the seller and an important negotiation point. Rechecking these documents, will allow the buyer to ascertain that the seller and the agent has the authority to sell the property. There is no standard deposit amount in Bangkok and in many cases, this is a point of negotiation for the buyer and seller. The Editorial usually advises buyers to keep this amount as low as possible, with a symbolic 50-150,000 THB usually being enough to reserve the property. When making any payment, it is important to keep records of deposit payments via property agency receipts and/or a simple letter of understanding. At this stage, it is important to ensure Booking is refundable pending review and signing of the SPA. In most cases the Sales and Purchase Agreement is drafted by a property agency or if required via a law firm. This agreement is generally straightforward, with the seller on the one hand confirming they have the right to sell and are doing so without encumbrance; and the buyer confirming they will make payment and transfer within a set deadline, pending the due diligence process. It is usual practice for foreign buyers to set a timeline of 30-45 days, leaving them extra-time to conduct the due diligence process and prepare their funds. Compare Copy of Title Deed with original held at the Land Office. Ensure owner on Title Deed matches with Seller ID/Passport initially provided. Ensure there is no mortgage or charge on the unit. During this process, any questions regarding the property and its ownership can be reviewed; allowing the buyer to raise any uncertainties or possible red flags. At this stage, buyer and seller must prepare numerous documents and items that will be required for a successful transfer at the Land Office. Copy of Marriage Certificate (If Married). Spouse Consent Form (If Married). If married, spouse will need to be present on transfer day (If absent on transfer day, a Power of Attorney is required). Name of Buyer’s Mother and Father. Cashier Cheques and Cash (For Seller, Bank/Financial Institution if applicable, and Government Taxes/Fees if applicable). *To obtain the Foreign Exchange Transaction Form (FET) or Bank Certificate: Funds for the purchase of the property will need to be transferred from overseas and certain requirements will need to be followed. More information is provided below in Section 3.3 of this guide. Original Thai ID Card or Passport. Original House Registration Book (Tabien Baan). Quit Claim Deed (Document issued by Condo Juristic Office, confirming seller has no pending settlement with the building). Electricity Meter Deposit Receipt and Up-to-date Utility Bill. Warranties of Electrical Appliances (If any). Original Developer Welcome Pack (If any). Keys, Key Cards, Access Cards, Parking Stickers, etc. If the seller has a mortgage on the Unit, they will have to inform and set an appointment with the financial institution’s officer. This officer will be present on the day of transfer to remove their charge on the title deed. Once Step 3 is concluded, buyer and seller can meet on the agreed appointment date at the Land Department. If either the buyer or seller cannot be present on the day of transfer, a Power of Attorney will need to be prepared beforehand. Cashier Cheque for relevant Govt. Taxes or Fees in an amount lower than what is due. Cash for outstanding balance of Govt. Taxes or Fees. It is important to note, that govt. taxes and fees are paid directly to the Land Office; these payments need to be made in the exact amount due, as no refunds will be processed for overpayments. Therefore, a combination of cashier cheque and cash needs to be prepared. On the day of transfer, the Land Officer will review all the documents and see if this complies with the required laws and regulations. If all documents are confirmed ok, the Land Officer will invite the two parties to go and pay all sales taxes and transfer fees. Once payment is receipted, the Land Office will proceed to strikeout the name of the seller and subsequently add the name of the new owner on the Title Deeds. 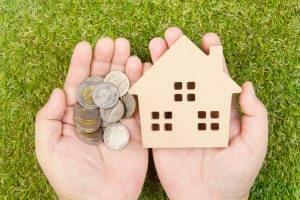 Upon completion of the process, the buyer can release funds for the purchase of the property. It is a standard for security reasons, to pay the buyer with a cashier cheque. Once funds are paid, the seller can release all keys, access cards and relevant documents. At this stage, the transfer is successfully completed! It is important to confirm, the signing of a Power of Attorney for the transfer of electricity. This needs to be signed, along with the provision of the electric meter deposit receipt and the latest paid electric bill receipt. This is to ensure, a smooth transfer of utilities to the new owner. Finally, it is also important to contact Building Management of the condo and provide them with a copy of the title deed, passport and contact details of the new owner. 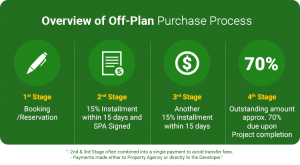 Off-plan projects are usually marketed and sold using a delayed payment plan with installments spread out over several months or even years (Depending on completion date). This appealing payment structure is offered to limit the buyers’ upfront risk and for the developer to guarantee purchase commitments early in the development process. Payments of booking and subsequent installments are usually transferred directly into the developer’s designated account. This is so that they can process FET or Bank Certificates on behalf of buyers to comply with Thai Condominium laws. 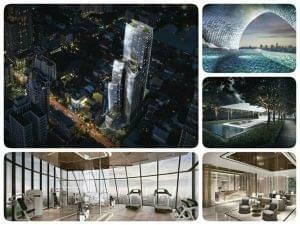 This is a symbolic amount that usually ranges between 50-150,000 THB, to reserve a condo unit. This payment will put the unit on-hold and the developer will usually stop marketing pending payment of the first installment. Before paying the Booking, it is important to recheck the developer’s terms and conditions as some will state that this payment is non-refundable. After booking the unit, the developer will prepare the SPA and forward it to the buyer for review. Once confirmed, the buyer is expected to sign and return the agreement and make payment for 15% of the total purchase price. In total, the buyer will be expected to pay 30% of the unit’s sales price within 30-days. Some developers may bundle the 2nd and 3rd payments into a single 30% transfer to simplify the process. Also, it is important to note, while 30% installment pre-completion is the standard for most projects, some developers may request a higher upfront payment. Once the project is completed, the buyer will be invited to come and inspect their unit and check for any internal defects. If everything is ok, the buyer is expected to transfer the remaining balance. Upon receipt of final payment, the developer will transfer the Title Deed into the buyer’s name. If the purpose of opening a Thai bank account is the purchase of a property, the process is relatively straightforward. It is important to note that different banks and branches may have different document requirements. Foreigners are always advised to makes their account opening application in a branch that is used to servicing foreign clients. These documents are usually enough to open a Bank Account, apply for a debit card and get access to the Bank’s online banking facilities. An important requirement for Foreign Buyers of Thai property, is the need to apply for a Foreign Exchange Transaction Form (FET) or Bank Certificate. These documents are mandatory according to the Thai Condominium Laws, that require foreigners to show proof that money was transferred from overseas to make payment for a property. Funds need to be transferred from the buyer’s foreign bank account. Funds must be transferred in the remitter’s local currency and converted into Thai Baht by the beneficiary’s Thai Bank. Funds received, must exceed the purchase price of the property. Money Transfers from overseas usually take between 2-5 working days to process. Once received, the bank will get into contact with the beneficiary and request authorization to convert the foreign currency transfer. Once this is completed, the buyer and his agent can visit a local bank branch and apply for an FET or Bank Certificate. For any one looking to invest in real estate, taxes are an important consideration. As tough tax rates can quickly erode potential profit, resulting in substandard gains for investors; this is the case in several countries worldwide! There are several components to sales taxes locally, however the calculations are relatively easy to understand! Transfer Fees are typically shared equally between the buyer and seller. Transfer Fees represent 2% of the Government appraised value; therefore, the seller is expected to pay 1% and the buyer 1%. Specific Business Tax is applicable for any property that is sold within 5-years of ownership. The Tax is equivalent to 3.3% of the Government appraised value or agreed sales price (Whichever is higher). However, if the owner has their name registered in the House Registration Book of the property, they are exempt from SBT within 1-year of ownership. This is payable if the seller is exempt from paying SBT. The Stamp Duty represents 0.5% of the appraised value or agreed sales price (Whichever is higher). It is important to note that despite it’s misleading name, this Tax has nothing to do with the personal income of the seller. To calculate this marginal tax, several factors such as govt. appraised value, period of ownership and deductions based on depreciation are used. The variety of variables used for this tax, means that it is particularly difficult to calculate. *Sales Price was used as tax amount was higher. For anyone looking for a shortcut, this Thai website offers an online calculator! 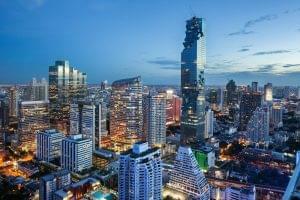 Can I get financing from a local Bank to buy property in Bangkok? Unfortunately, it is important to understand the context of this answer. While it is possible to get financing in Bangkok, in many cases these financial products can be elusive or difficult to access. The main commercial banks tend to be conservative when offering loans to foreign nationals; usually only offering them to individuals with extensive professional and business links to Thailand (I.e. Several years of employment, business owners with years of audited revenue and profit, etc.). Higher interest rates compared to ordinary loans accessed by locals. MBK finance, is usually the go-to institution for expats and foreign buyers. It offers comprehensive and easy to access mortgage products for condos and landed property such as villas and town houses. UOB a Singaporean Bank, has been known to favor applications from Singaporeans. These buyers can apply and repay their mortgage settlements in SG Dollars from their home country. Another recommendation, residents of Hong Kong can also get access to loans by applying at the HK Offices of Kbank and Bangkok Bank. These two commercial banks have been known to facilitate applications for HK nationals; they can subsequently settle their repayments in HK Dollars from their home country. The Editorial only recommends this option for buyers looking for a primary or secondary-home. As long-term ownership and gradual capital appreciation is the main way to profit from these investment structures. So, you’ve purchased a Condo in Bangkok, what’s next? This section will review topics dealing with post-acquisition and property management. We will start-off with the costs of property upkeep and other associated expenses of ownership. Rental investors will be provided information about how to find tenants. Finally, in the last section, Bangkok agency commissions standards will be reviewed and explained. A major long-term advantage of investing in Bangkok Property is the low cost of upkeep and ownership. With no residence or local government tax, in effect landlords in Bangkok have little to no expenses. Any condo building will usually have a building management team and common areas that will need to be maintained. Therefore, landlords are charged an annual management fee; usually this is referred to as Common Area Management Fee (CAM Fees) and is usually collected in advance for the year. The CAM Fees are calculated on a per square meter basis (E.g. 30 THB per/square meters). As a rule of thumb, Management Fees are equivalent to approx. 1-month of rent. Landlords are obviously liable for utility expenses, linked to the consumption of electricity and water. If a property is rented, utility bills are paid by the tenant. If the property is a rental investment, it is very likely that the services of a property agency will be contracted. Agency service fees are charged at the standard commission rate of 1-month rent for a 1-year lease. More information regarding this subject is provided below. There are no laws requiring landlords to purchase property insurance and it is not very common for owners to purchase coverage. As for major building issues (I.e. Fire or Flood Damage), these are covered by the building insurance, that is paid as part of the CAM Fees. You’ve finally completed the acquisition of a rental condo investment. It’s now time to turn your property into an income producing asset! 1. In Bangkok, most renters expect a property to be fully-furnished. While cutlery, linen and towels are not required, these can be used to accessorize and add presentation-value to a condo. 2. Ensure all electrical appliances are installed and/or functioning. Do not forget to check small details such as Air Cons and Water Heaters that can be difficult to fix or maintain once a tenant has moved-in. 3. Recheck property for any issues or snags, this includes any loose tiles, damaged flooring or any non-standard issues (I.e. Water damage or minor leaks). Fixing these issues pre-tenancy can mitigate bigger problems during a tenancy. The next step is finding a tenant, which can be done either via direct ads posted on property websites or social media such as Facebook. Another more direct and convenient way, is simply to contact a property agency. There are no real estate licenses in Bangkok, as a result anyone can offer property agency services; therefore, ensure you check the credentials and experience of the agency you are instructing. When instructing them, ensure you provide clear unit details (Unit, Floor), specifications (Bed, Bath and Size) and instruction on how to access the property. The most common way to give access to an agency is by keeping keys and access cards at the condo’s management office; requesting, an agent signs-in and out when collecting keys to show clients. The length of the vacancy period of a condo, depends on a variety of factors such as the project specs, unit layout, location factors, agencies instructed etc. Therefore, it is always difficult to provide an exact timeframe to find a tenant. Usually in Bangkok, finding a tenant can take anything from less-than 1 Month to 3 Months. If a property is successfully marketed, the landlord will receive offers. It is standard in Bangkok for renters to request price discounts or additional requests (I.e. Free Internet, addition of chairs, etc.). Bangkok is a renters’ market and landlords are always advised to keep an open-mind to different types of negotiations. If negotiations are successful, the rental client will pay a Booking Fee (Advance Rent) of 1-month rent. This can be held by either the landlord or the introducing agent. Normally, if an agency has been instructed, they will prepare a Lease Agreement and a supporting Inventory. Depending on the situation of the landlord and his future tenant, usually all parties meets on the signing date (Signing can also be done separately). The Lease Agreement and Inventory are rechecked and signed on that day. Also, the tenant has a chance to review the condition of the property and point-out any potential defect or issue pre-tenancy. Finally, once completed the tenant will pay the Security Deposit of 2-month rent directly to the landlord. Therefore, in total the landlord will receive 3-months rent upfront. Going forward, it is standard for rental payments to be transferred directly to the landlord’s account each month. There is no real estate license or legislation regulating the practices and standards of Property Agencies in Bangkok. This means the standards of service can vary greatly. Therefore, it is always important for landlords to carefully check the credentials and experience of the property professionals they instruct. As a quick tip, the easiest way to do this is to recheck the Google or Facebook Reviews of an agency. 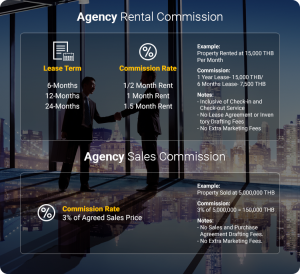 In Bangkok, property agency sales and marketing fees are paid for by the property owners; most agencies and freelancers charge standard rates for sales and rentals. *This on applies to re-sales condos, rates for off-plan properties may vary by agency. Property owners should be aware, it is not standard for Agencies to request extra marketing fees for add-on services. Therefore, local realtors should not be requesting extra payments for professional photos or marketing campaigns. On a final note, overseas landlords may consider also instructing a property agency for property management. In Bangkok, this is a relatively new service offering and service rates may vary. Conclusion of this Buyers’ Guide! All good things must come to an end, well done for completing this guide. In this section, we’ll basically wrap things up! Buying property in Bangkok is an extensive discussion and while this guide has covered the essentials, it has barely scratched the surface of investing in the City’s real estate! Investing in Bangkok can be a lucrative activity, where fortunes can be made. However, to profit and be successful, our Editorial always stresses caution and careful research; as the saying goes, “Knowledge is power”. To help investors, Fresh’s Editorial constantly publishes coverage of insights, trends and news about the Bangkok property market. This section will list some interesting resources for further reading. The Mixed-Use Developments Redefining Bangkok! Old Bangkok Condos an Opportunity? Bangkok’s Second-Hand Condo Market: The Growing Gap! 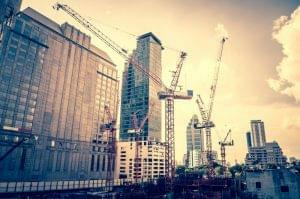 Renovating Condos, Bangkok’s next investment opportunity? We have been publishing articles about Bangkok and its vibrant property market for over 2-years. So, we’ve obviously left out numerous insightful and interesting articles! Readers can find more articles and insights on: Fresh Property’s Blog. This guide was carefully crafted and curated in close collaboration with a variety of property professionals and experts. 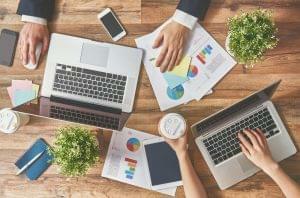 To complete this expansive resource, Fresh’s Editorial worked alongside it’s in-house Sales Team and other close associates notably Investors, Lawyers and other fellow Realtors. Their practical advice, first-hand experience and broad depth of knowledge, helped to ensure the veracity of this guide. The Editorial would like to express our warm regards and say a big thank you, to everyone who contributed! Bangkok is both an impressive and beautiful city, and our hope as a modest agency is to contribute in making the local market, a more transparent investment destination. On a final note, this “Wikipedia” style guide will be constantly updated and improved. Therefore, if we missed any topic or if you would like more information, you are welcome to leave a comment below. Ps: If you are looking to buy a Bangkok property investment or home, Fresh has an extensive portfolio of resale and off-plan condos. So please don’t hesitate to get into contact!